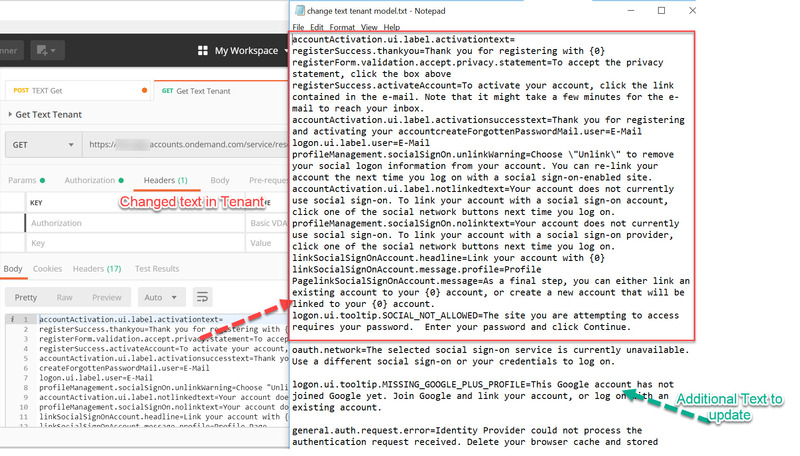 This blog would explain steps to changing tenant text for your SAP Cloud Platform Identity Authentication. 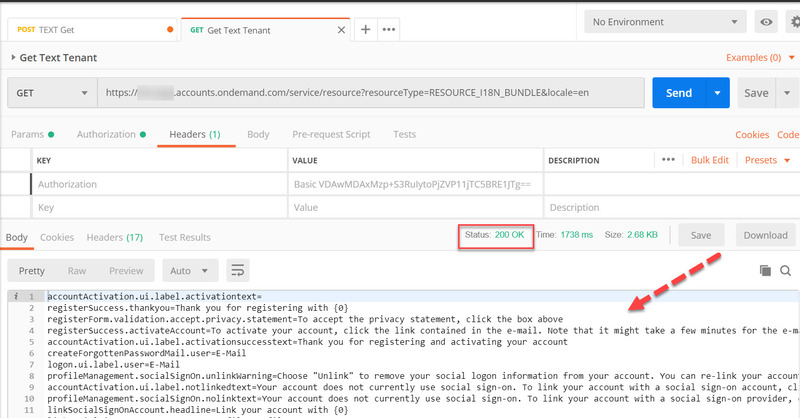 Use the GET method to obtain the texts that overwrote part of the predefined tenant texts when your custom tenant was created, change the texts that you want, add them to the POST request and upload them. If there are no predefined changed texts for your tenant, the GET Tenant Texts returns the 404 Not Found code. In this case, proceed with the POST Tenant Texts method. 2. One important tip is that you require an user with “Administrator access”,as described by SAP Note: 2650614 – Identity Authentication Service – Cannot change logon screen labels – 403 Forbidden. Create a new user under Users & Applications > Administrators. Create an “System Users” with the following minimum authorizations. 5. Use your System Adminstration User created in SAP Identity Authentication Service. In Postman create a new GET method with authentication type = Basic Authorization. Be careful with parameter “Locale” as is key sensitive. Use the language for the end user screen. 6. Press “Send” and after getting the result used button “Copied to clipboard” to save text changed in your tenant. 7. Save your text in a notepad. Now to update your text tenant, there are some tricky steps. Second, you don’t need to upload all text again, only text that you would like to change. Your Post API only would contain the text you want to update. 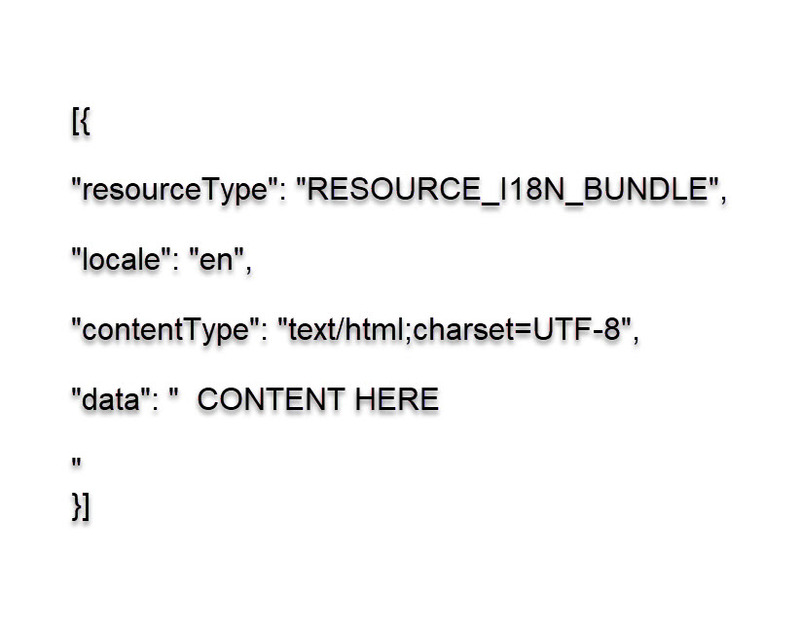 So, basically identify from the link Standard Tenant Text, only the text that you would like to update and merge with text downloaded from GET Method API (text that overwrote part of the predefined tenant texts when you custom tenant was created). Ensure that you have removed the comment lines in your file. The comment lines are introduced by the # (number or hash) sign. Remember to use your System Administration user for this API. As final steps, be careful to have proper Escape Sequences, as any missing sequence would result of system fail to identify the right text. Specially the \r\n” at the end. As you can see, you have a variety of text that could be updated. See my result updated text below. This include titles, labels and buttons. 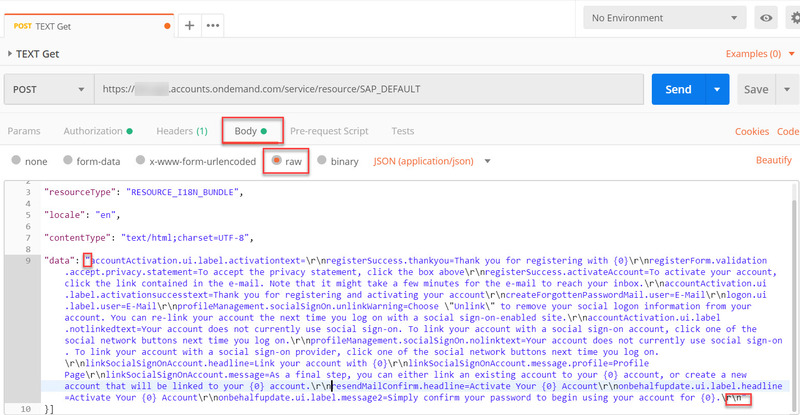 Nice blog Lyda Osorio – I am finding more and more customers wanting to modify the form and field content on the SAP Cloud Identity Authentication screens so definitely looking forward to referencing this blog to do that. Something tells me I need to take my time with this to make sure I follow the steps.